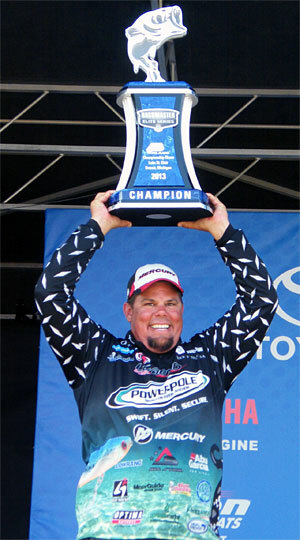 Chris Lane gets his 2014 Bassmaster Classic spot courtesy of his August 22-25, 2013 Elite Series Plano Championship Chase victory on Lake St Clair. The Bassmaster Elite Series Plano Championship Chase was billed as Lake St. Clair's chance to show the world why it was named the best bass fishing lake in the U.S. But Lake Erie and Lake Huron didn't follow the script, stealing the limelight from Lake St. Clair and putting the "great" in Great Lakes bass fishing. A lot was at stake in the final Elite tournament of the year but most of the drama ended before the tournament did. The 2013 Angler of the Year (AOY), 2013 Rookie of the Year (ROY), Toyota All-Star Week tournament bids and 2014 Bassmaster Classic bids were mostly decided by the end of the third day leaving only the outcome of the tournament itself in question going into the final day. Chris Lane and Mark Davis swapped leads over the first three days of the tournament but Davis stumbled on day four, bringing only four fish to the scales and allowing Lane and his nearly 20 pound bag of five fish to coast to victory. In addition to the $100,000 first place prize, the win also clinched a spot in the 2014 Classic for Lane. Lane and Davis were among a group of successful anglers who bypassed Lake St. Clair in favor of Lake Huron or Lake Erie. These big waters offered potentially bigger bass for those willing make long runs through rough waters. It was a classic risk vs. reward tradeoff - one that both rewarded and punished Aaron Martens. Returning from Lake Erie on the final day with a limit of smallies in his livewell that would have put him close to Lane's final winning weight, Martens hit a series of large waves that snapped two of his outboard's mounting bolts and left him dead in the water and unable to make it back in time for the weigh in. Fortunately for Martens, he'd locked up the AOY title the day before when Edwin Evers – leading the AOY points race over Martens and Kevin VanDam leading up to the tournament - opened the door with a poor showing on the first day. While Martens riskier decision to fish Lake Erie paid off, KVD's more conservative decision to fish closer to the launch site on Lake St. Clair didn't. KVD caught plenty of bass in Lake St. Clair but couldn't match the top weights coming from Erie or Huron. Pointing out that bass caught from Lake St. Clair seemed thinner than those from Lake Erie or Lake Huron, he noted that "it seems like Lake St. Clair is in kind of down cycle in its forage base right now. Hopefully it will bounce back". Jonathon VanDam also focused on Lake St. Clair and reiterated KVD's observation of skinny bass on Lake St. Clair this year. JVD also found that Lake St. Clair bass had not moved into the channels as much as in previous years. "On the third day I went to a channel spot where I did really well in last year's Bassmaster Northern Open but the bass just weren't there", said JVD. Mike Thomas, Michigan Department of Natural Resources Fisheries Biologist heard the reports of Lake St. Clair's "skinny" smallmouth bass and decided to investigate. Thomas collected 25 samples of representative "fat" and "skinny" bass from the weigh in tanks and conducted a visual inspection. He found no signs of stress or disease but is sending them to Michigan State University's Diagnostic Center for Population and Animal Health (DCPAH) for a more detailed analysis. Thomas did offer a few possible explanations for what anglers are reporting. "First of all, ‘skinny' and ‘fat' are relative terms", said Thomas, suggesting that part of the issue may be anglers' perceptions and unfair comparisons to a year – 2012 – when bass were unusually well fed and fat. "We collected bass from Lake St. Clair throughout the summer and while I wouldn't call them ‘fat', they certainly weren't skinny", added Thomas. Thomas does concur with JVD's observation that bass didn't migrate as much into the channels this year. He attributes that to the severe temperature fluctuations that occurred in late July – about the time when bass would typically begin their migration. Thomas also thought it was possible that the same temperature fluctuations that altered bass' late summer channel migration could have affected prey migration patterns, making it more difficult for bass to locate food and thereby thinner fish. Statistically, the 2013 Elite tournament results compare favorably to both the 2012 Bassmasters Northern Open and the 2012 FLW Detroit River Open (see figure 1). Average weight per fish was slightly (5%) below the FLW Open, but anglers brought about 3% more bass to the scales. The number of anglers who averaged more than four pounds per bass - the unofficial benchmark of Lake St. Clair success – was nearly identical for all three tournaments. Despite being considered "home waters" for the four Michigan Elite pros, only Nate Wellman made the fourth day cut, finishing a very respectable 5th place overall. 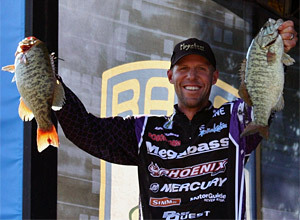 Jonathon VanDam, Kevin VanDam and Chad Pipkens, the other Michigan Elite pros, finished 31st, 47th and 74th respectively. Overall, the tournament was a tremendous success even if the bass weren't always where anglers expected them to be – or as big as they'd hoped.